Within CARBOCHANGE, scientists from 30 research institutes across the world dedicate their work to quantifying oceanic carbon (CO2) uptake under changing climate conditions. In a unique approach, CARBOCHANGE combines both observational and modelling research and uses past and present data to infer on our ocean‘s future. Next to water vapour, carbon dioxide (CO2) is the most important greenhouse gas in Earth’s atmosphere. Excess CO2 from human activities is the most important driver for ongoing global warming and related climatic change. The rate at which CO2 concentrations are currently rising in the atmosphere is greater than ever before in Earth‘s geologic history, being primarily caused by human-induced fossil fuel combustion, cement manufacturing and land-use changes . Considering the key role of our oceans (Fig. 1) in regulating atmospheric CO2 concentrations [1,2], it is vital to understand how much CO2 can effectively be buffered in the marine realm within a given time frame. 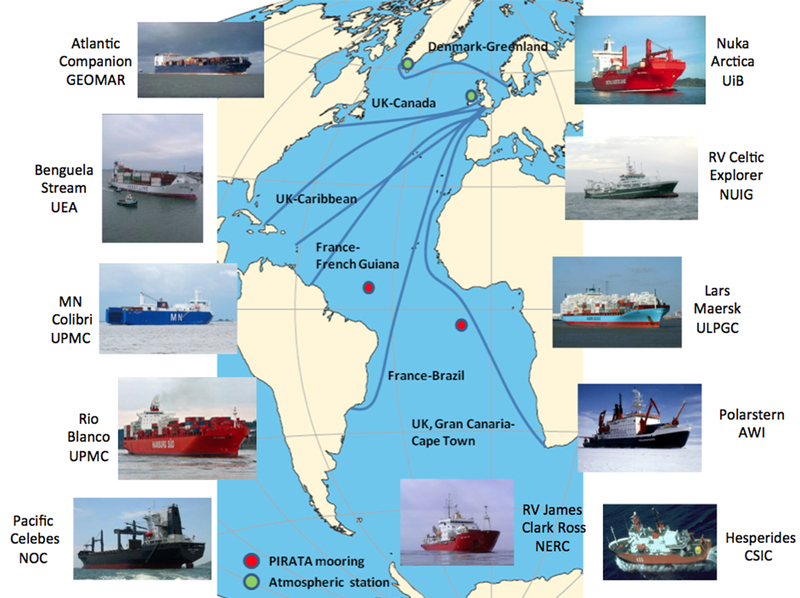 Of particular importance are expected future developments of the oceanic carbon sink under future scenarios for greenhouse gas emissions and climate change. Fig. 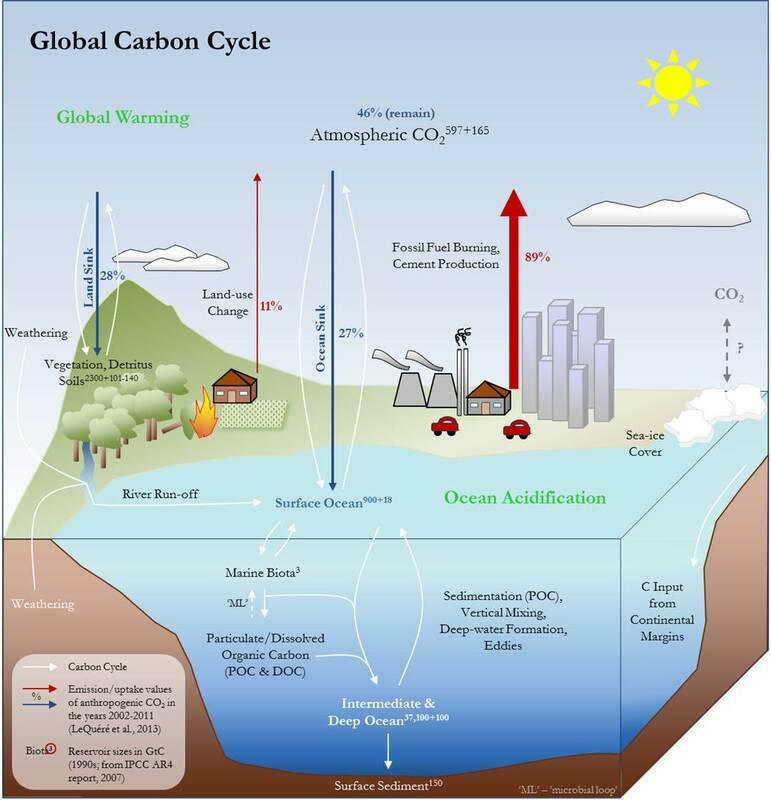 1 – The Global Carbon Cycle is a complex interplay of different biogeochemical processes, affecting Earth’s terrestrial, marine and atmospheric realms. In the atmosphere, CO2 acts as a greenhouse gas (together with water vapor, methane, nitrous oxide, ozone and other compounds), meaning that it retains thermal radiative energy outgoing from the Earth’s surface within the lower parts of the atmosphere. Without this effect, Earth’s surface temperature would probably not be above -19°C . Oceans play a key role in regulating atmospheric CO2 [1,2] through physical, chemical and biological processes. The physical carbon pump is mainly driven by gas exchange, dissolution, dissociation and mixing of water masses. While a small amount of the CO2 is kept in the oceans in its gaseous state, most of it reacts with seawater and dissociates into bicarbonate (HCO3-) and carbonate (CO32-) under a decrease in pH value. The sum of gaseous CO2, carbonate, and bicarbonate make up the total dissolved inorganic carbon (DIC). The physical processes by which CO2 enters and circulates the marine realm ultimately limit the oceanic uptake of anthropogenic carbon (CO2) to a certain amount per time. In addition, carbonate chemistry regulates the maximum buffering capacity of the oceans, which decreases with increasing CO2 concentrations [4,5]. The biological cycling of carbon in the surface ocean is mainly photosynthesis-driven: Phytoplankton converts dissolved CO2 into biomass that can then be utilized by other organisms. Particulate organic carbon (POC; living organisms, detritus, aggregates) is produced, which eventually sinks through the water column towards the seafloor. While shallow (shelf) sediments can be rich in organic matter, usually less than 1% of POC reaches the open-ocean seafloor by sedimentation as most of the POC is already remineralized in the euphotic zone [6,7]. 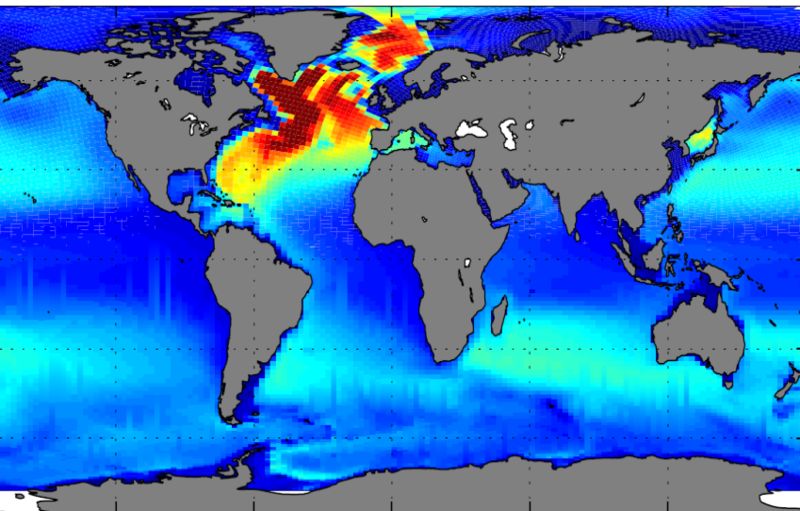 Biologically derived dissolved organic carbon (DOC; small organic substances with sizes below 0.7-0.22 µm) does not sink through the water column but is transported through the oceans like DIC by mixing processes. Depending on the type of DOC, it may be turned over by microbial action within minutes or may persist and accumulate in the surface ocean before being circulated to deeper waters . While part of the utilized DOC is converted back to its inorganic constituents, another fraction is turned over in the so-called ‘microbial loop’, in which bacteria use DOC to build up biomass that can be consumed by organisms on higher trophic levels [8,9,10]. As long as the nutrient cycling and the nutrient consumption by biota is not changed, the biological carbon cycling would not alter the atmospheric CO2 content as compared to the pre-industrial quasi-steady-state. In Fig. 1 the main pathways for the global carbon cycle are depicted by white arrows. Without anthropogenic perturbation, global carbon fluxes would be in quasi-equilibrium. However, since the beginning of the Industrial Era (approx. 1750) and caused mainly by fossil fuel combustion, cement facturing and land-use change1, atmospheric CO2 concentrations have increased at an alarmingly fast rate, potentially accelerating climate change effects. In part, this is counteracted by the uptake of CO2 into Earth’s oceans. The marine realm represents a large and still quite quickly overturning carbon reservoir within the Earth system, exceeding the land and atmospheric pools by at least 16-fold and 63-fold, respectively (IPCC AR4 report, 2007; determined for the 1990s). By 2010, the ocean is estimated to have taken up 155±31 PgC of the 530 PgC emitted through human activities . be used to obtain the latest data of e.g. temperature, salinity, pH, oxygen, nutrients, pCO2 (partial pressure of CO2), fCO2 (fugacity of CO2), DIC (dissolved inorganic carbon) or DOC (dissolved organic carbon). 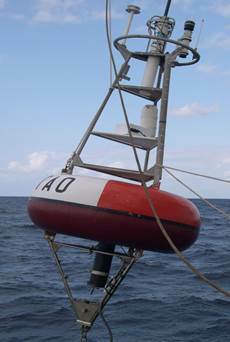 Temporal and spatial fluctuations in air-sea CO2 fluxes in the surface ocean (see SOCAT) as well as carbon fluxes in subsurface waters will be investigated. Satellite measurements will be used to estimate biological primary productivity and to obtain information on wind fields. Already existing data from previous research and the most recent accessible data will be combined with various modelling approaches to compile a comprehensive set of uptake/emission scenarios on different spatial and temporal scales and to calibrate and improve existing models. Modelling (Fig. 4) will include the application of cutting-edge interactive carbon cycle climate models (Earth System Models) under a variety of emission scenarios as well as coupled land-ocean models. Ultimately, this research will help to estimate the expected consequences for marine ecosystem biodiversity and functioning by supplying key parameters for experimental set ups. Synthesis reports on observational and modelling results will serve as input for international assessments on climate change and may help to guide the management of CO2 emission reductions. Sabine CL, Feely RA, Gruber N, Key RM, Lee K, Bullister JL, Wanninkhof R, Wong CS, Wallace DWR, Tilbrook B, Millero FJ, Peng T-H, Kozyr A, Ono T & Rios AF (2004) The oceanic sink for anthropogenic CO2. Science 305: 367-371. doi: 10.1126/science.1097403. Ramanathan V, Callis L, Cess R, Hansen J, Isaksen I, Kuhn W, Lacis A, Luther F, Mahlman J, Reck R & Schlesinger M (1987) Climate-chemical interactions and effects of changing atmospheric trace gases. Reviews of Geophysics 25: 1441-1482. doi: 10.1029/RG025i007p01441. Archer D (2005) Fate of fossil fuel CO2 in geologic time. Journal of Geophysical Research 110: C09S05. doi: 10.1029/2004JC002625. Lee C, Wakeham S & Arnosti C (2004) Particulate organic matter in the sea: the composition conundrum. Ambio 33: 565-575. doi: 10.2307/4315547. Hedges JI (1992) Global biogeochemical cycles: progress and problems. Marine Chemistry 39: 67-93. doi: 10.1016/0304-4203(92)90096-S.
 Carlson CA (2002) Chapter 4: Production and Removal Processes. In: Hansell D & Carlson C (eds). Biogeochemistry of Marine Dissolved Organic Matter. pp. 91-152. Academic Press. Azam F, Fenchel T, Field JG, Gray JS, Meyer-Reil LA & Thingstad F (1983) The ecological role of water-column microbes in the sea. Marine Ecology Progress Series 10: 257-263. Fenchel T (2008) The microbial loop – 25 years later. Journal of Experimental Marine Biology and Ecology 366: 99-103. doi: 10.1016/j.jembe.2008.07.013. [Fig.4] Tjiputra JF, Assmann K, Bentsen M, Bethke I, Otterå OH, Sturm C & Heinze C (2010) Bergen Earth system model (BCM-C): model description and regional climate-carbon cycle feedbacks assessment. Geoscientific Model Development 3: 123-141. doi:10.5194/gmd-3-123-2010. 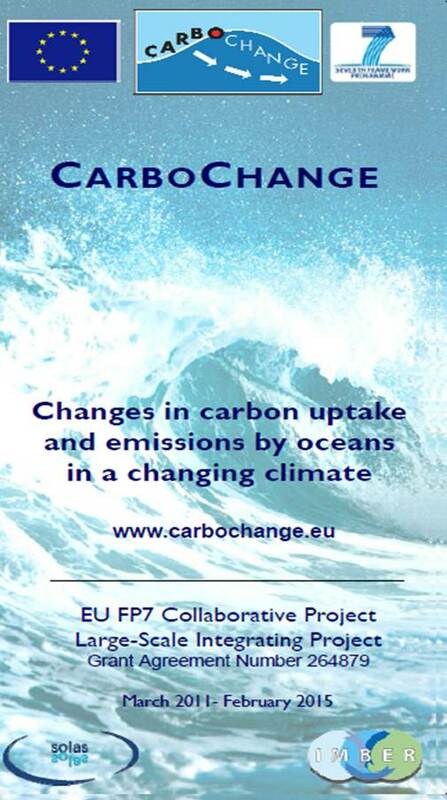 CARBOCHANGE is a Collaborative Project funded by the European Commission’s Seventh Framework Programme (2007-2013), grant agreement number 264879. The project started in March 2011 and came to an end in February 2015.